Aircraft electrical power can be derived from a variety of sources; these are categorized as either primary or secondary sources. Batteries and generators are primary sources of electrical power; inverters and trans former rectifier units (TRU) are secondary sources of power. This power is either in the form of direct or alternating current depending on system requirements. In addition to onboard equipment, most air craft have the facility to be connected to an external power source during servicing or maintenance. The basic power source found on most aircraft is the battery, delivering direct current (DC). Generators can supply either direct or alternating current; the outputs of generators need to be regulated. Alternating cur rent generators are also referred to as alternators. Inverters are used to convert DC (usually from the battery) into alternating current (AC). Transformer rectifier units (TRU) convert AC into DC; these are often used to charge batteries from AC generators. In some installations transformers (as described in Section 1) are used to convert AC into AC, typically for stepping down from 115 to 26 V AC. An auxiliary power unit (APU) is normally used for starting the aircraft's main engines via the air distribution system. While the aircraft is on the ground, the APU can also provide electrical power. In the event of generator failure(s), continuous power can be provided by a ram air turbine (RAT). 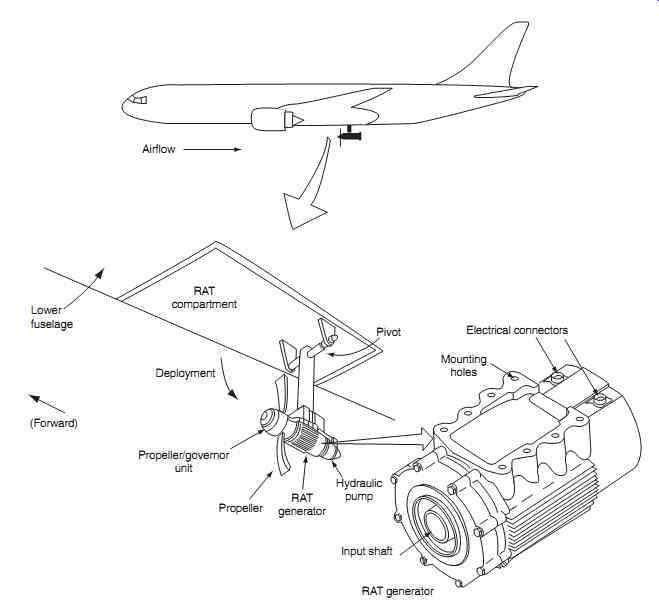 In this section, we review the various sources of electrical power used on aircraft and their typical applications. We know from basic theory that a generator's out put will vary depending on the input shaft speed. A means of regulating the generator's output is therefore required. This device comprises voltage and current regulators as shown in FIG. 1. They are used on small general aviation (GA) aircraft that have relatively low genera tor power outputs. When the engine starts, the alternator output voltage builds up rapidly to the nominal aircraft level (either 14 or 28 V DC). Contacts of both regulators remain closed to allow current to flow into the field windings. When the generator output voltage increases beyond 14/28 V, the voltage coil contacts open and this introduces the resistor into the field windings, thereby reducing the field excitation cur rent, and subsequently reduces the generator output. Once the output voltage drops to below 14/28 V, the contacts close (by a spring mechanism) and the resistor is bypassed, allowing full excitation current back into the field. The on/off cycle repeats between 50 and 200 times per second, or 50-200 Hz. 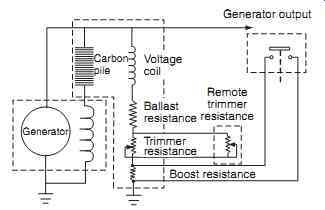 This process regulates the generator output to a mean level, typically 14 _ 0.5 V (or 28 _ 1 volt). Current regulation is achieved in a similar way, i.e. by controlling the field current. When loads are high, the voltage output may be insufficient to open the contacts. The result is that the output will continue to increase until the maximum rated current is reached. At this point, the current regulator contacts open and the resistor is connected into the field windings. 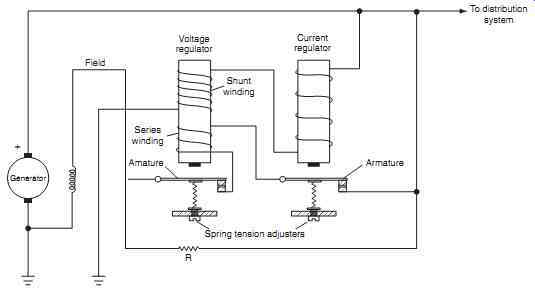 The accuracy of this type of regulation depends on the resistor value and spring tensions. In the event of high rotor speed and low electrical load on the genera tor, the output could exceed the specified system volt age despite the field being supplied via the resistor. In this event, the contact is pulled to ground, thereby reducing the output to below the regulated mean level. The accuracy of the vibrating contact regulator depends on the resistor value and spring tension. 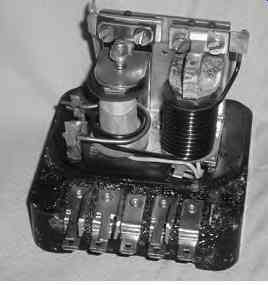 Another type of electromechanical regulator is the carbon-pile device. This type of regulator is used in generator systems with outputs in excess of 50 A and provides smoother regulation compared with the vibrating contact regulator. 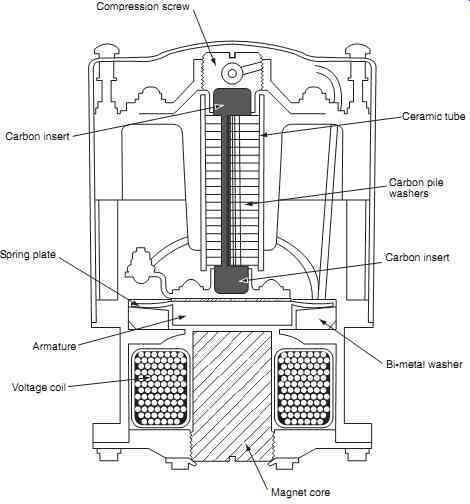 Carbon-pile regulators consists of a variable resistance in series with the generator's shunt wound field coil. The variable resistance is achieved with a stack (or pile) of carbon discs (washers). These are retained by a ceramic rube that keeps the discs aligned. FIG. 3 shows the main features of the regulator in cross-section. The surface of each disc is relatively rough; applying pres sure to the discs creates more surface contact, thereby reducing the resistance of the pile. When pressure is reduced, the reverse process happens, and the resistance through the pile increases. Pressure is applied to the pile by a spring plate. This compression is opposed by the action of an electromagnet connected to the generator output; the strength of the electro magnet's flux varies in proportion with generator output voltage. - Compression screw: the means of setting up compression on the pile and compensating for erosion of the pile during its life. - Spring plate and armature: this compresses the pile to its minimum resistance position. - Voltage coil: contains a large number of turns of copper wire and, with the core screw, forms an electromagnet when connected across the generator output. - Magnet core: concentrates the coil flux; it is also used for voltage adjustment during servicing. - Bi-metallic washers: providing temperature compensation. FIG. 4 shows the carbon-pile regulator connected into the generator's regulating circuit. The ballast resistor has a low-temperature coefficient and minimizes the effects of temperature on the voltage coil. The trimmer resistors (in series with the ballast resistor) allow the generator output voltage to be trimmed on the aircraft. The boost resistor is normally shorted out; if the switch is opened it allows a slight increase in generator output to meet short-term increases in loading. This is achieved by temporarily reducing the current through the voltage coil. The boost resistor can either be located in the regulator and/or at a remote location for easy access during maintenance. Higher generator output increases the current in the carbon pile regulator, which reduces compression on the pile thereby increasing its resistance. Explain the purpose of the carbon pile regulator voltage coil. There are many types and configurations of electronic voltage regulators. A representative type is illustrated in FIG. 5. The alternator master switch used in AC systems energizes the field relay and applies current to the base of TR 2 and the resistor network of R 1, R 2, RV1. This network, together with the Zener diode (Z) is used to establish the nominal operating voltage. Zener diode Z conducts which turns on transistor TR1 , shorting out transistor TR 2 and TR 3 . The genera tor voltage falls and Zener diode Z stops conducting, thereby turning of transistor TR 1 . This turns transistors TR 2 and TR 3 back on, allowing the generator output to increase again. This operation is repeated many times per second as with the vibrating contact regulator; the difference being that electronic circuits have no moving parts and do not suffer from arcing across contacts. Diode D 1 provides protection against the back e.m.f. induced in the field each time TR 3 is switched. The trimming resistor R V1 can be used to adjust the nominal voltage output of the regulator. In addition to the onboard equipment that has been described, most aircraft have the facility to be connected to an external power source during servicing or maintenance. This allows systems to be operated without having to start the engines or use the battery. The external ground power can either be from a battery pack, a ground power unit (that has a diesel engine and generator) or from industrial power converters connected to the national grid. More details of external power and how it is used is given in Section 8. Inverters are used to convert direct current into alternating current. The input is typically from the battery; the output can be a low voltage (26 V AC) for use in instruments, or high voltage (115 V AC single or three phase) for driving loads such as pumps. 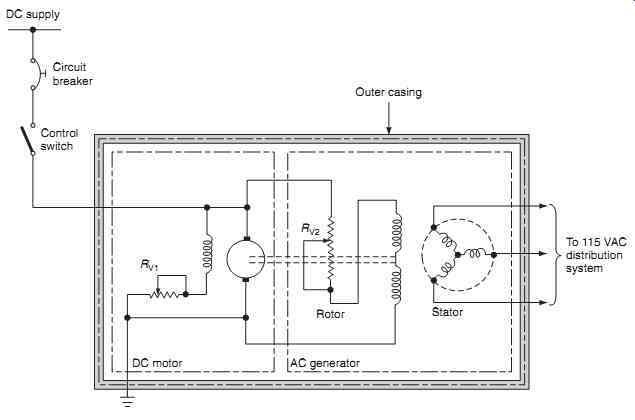 Older rotary inverter technology uses a DC motor to drive an AC generator, see FIG. 6 . A typical rotary inverter has a four-pole compound DC motor driving a star-wound AC generator. The outputs can be single- or three phase; 26 V AC, or 115 V AC. The desired output frequency of 400 Hz is determined by the DC input voltage. Various regulation methods are employed, e.g. a trimming resistor (R v ) connected in series with the DC motor field sets the correct speed when connected to the 14 or 28 V DC supply. 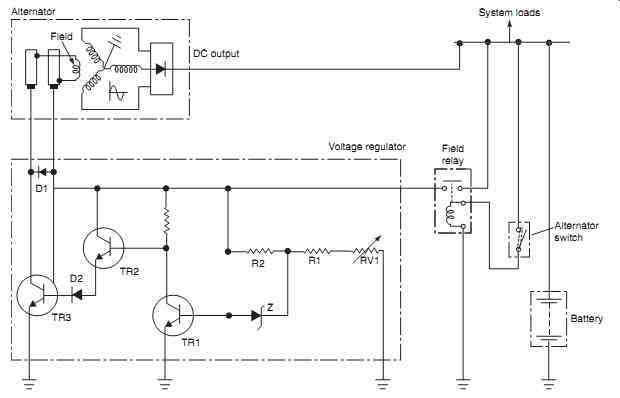 The desired output frequency of a rotary inverter is determined by the DC input voltage. Modern aircraft equipment is based on the static inverter; it is solid state, i.e. it has no moving parts (see FIG. 7 ). The DC power supply is connected to an oscillator; this produces a low-voltage 400 Hz output. 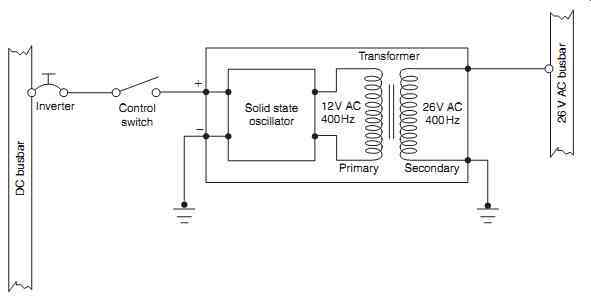 This output is stepped up to the desired AC output voltage via a transformer. The static inverter can either be used as the sole source of AC power or to supply specific equipment in the event that the main generator has failed. Alternatively they are used to provide power for passenger use, e.g. laptop computers. The DC input voltage is applied to an oscillator that produces a sinusoidal output voltage. This output is connected to a transformer that provides the required output volt age. Frequency and voltage controls are usually integrated within the static inverter; it therefore has no external means of adjustment. Inverters are used to convert direct current into alternating current. A typical inverter used on a large commercial aircraft can produce 1 kVA. Static inverters are located in an electrical equipment bay; a remote on/off switch in the flight compartment is used to isolate the inverter if required. FIG. 8 shows an inverter installation in a general aviation aircraft. Transformer rectifier units (TRU) convert AC into DC; these are often used to charge batteries from AC generators. A schematic diagram for a TRU is shown in FIG. 9 . The three-phase 115/200 V 400 Hz input is connected to star-wound primary windings of a transformer. The dual secondary windings are wound in star and delta configuration. 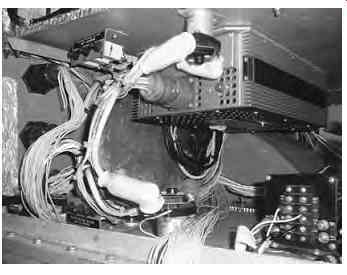 Outputs from each of the secondary windings are rectified and connected to the main output terminals. A series ( shunt ) resistor is used to derive the current output of the TRU. Overheat warnings are provided by locating thermal switches at key points within the TRU. Explain the applications of inverters and trans former rectifier units (TRUs). Transformers are devices that convert (or transfer) electrical energy from one circuit to another through inductively coupled electrical conductors. The transformer used as a power supply source can be considered as having an input (the primary conductors, or windings) and output (the secondary conductors, or windings). A changing current in the primary windings creates a changing magnetic field; this magnetic field induces a changing voltage in the secondary windings. By connecting a load in series with the secondary windings, current flows in the transformer. Circuits needing only small step-up/down ratios employ auto-transformers. These are formed from single winding, tapped in a specific way to form primary and secondary windings. Referring to FIG. 10(a) , when an alternating voltage is applied to the primary (P 1 -P 2) the magnetic field produces links with all turns on the windings and an EMF is induced in each turn. The output voltage is developed across the secondary turns (S1 -S 2 ) which can be connected for either step-up or step-down ratios. In practice, auto-transformers are smaller in size and weight than conventional transformers. Their disadvantage is that, since the primary and secondary windings are physically connected, a breakdown in insulation places the full primary e.m.f. onto the secondary winding. 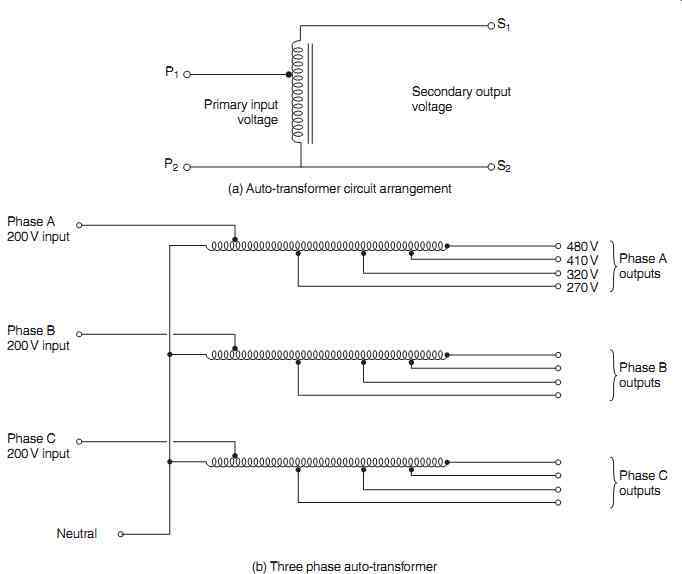 The arrangement for a three-phase auto-transformer is shown in FIG. 10(b) . This is a star - connected step-up configuration. Primary input voltage is the 200V AC from the aircraft alternator; multiple outputs are derived from the secondary tappings: 270, 320, 410 and 480 V AC. Applications for this type of arrangement include windscreen heating. Explain the difference between conventional and auto-transformers. An APU is a relatively small gas turbine engine, typically located in the tail cone of the aircraft. The APU is a two-stage centrifugal compressor with a single turbine. Bleed air is tapped from the compressor and connected into the aircraft's air distribution system. Once started the APU runs at constant speed, i.e. there is no throttle control. The APU shuts down automatically in the event of malfunction. The APU itself is started from the main aircraft battery. In some aircraft, the APU can also provide electrical power in the air in the event of main generator failure. The Boeing 787 aircraft has more electrical systems and less pneumatic systems than aircraft it is replacing. In this case the APU delivers only electrical power. APUs fitted to extended-range twin-engine operations aircraft (ETOPS) are critical to the continued safe flight of the aircraft since they supply electrical power, hydraulic pressure and an air supply in the event of a failed main engine generator or engine. Some APUs on larger four-engine aircraft are not certified for use while the aircraft is in flight. It is essential to remove electrical power from the relevant busbar (or in some cases the entire air craft) before removing or installing electrical components. Failure to observe this precaution can result in electric shock as well as damage to components and equipment. It is essential that electrical power is removed from an external power cable before connecting the cable to the aircraft. Failure to observe this precaution can result in electric shock as well as damage to components and equipment. In the event of generator failure, continuous power can be provided by a ram air turbine (RAT). Also referred to as an air-driven generator, this is an emergency source of power that can be called upon when normal power sources are not available. The RAT is an air-driven device that is stowed in the wing or fuselage and deployed in the event that the aircraft loses normal power. When deployed, it derives energy from the airflow, see FIG. 11 . RATs typically comprises a two-bladed fan, or propeller that drives the generator shaft via a governor unit and gearbox; the gear ratios increase the generator shaft speed. The RAT can be deployed between aircraft speeds of 120 to 430 knots; some RATs feature variable pitch blades operated by a hydraulic motor to maintain the device at typical speeds of 4,800 r.p.m. Typical RAT generators produces an AC output of 7.5 kVA to a TRU. Heaters are installed in the RAT generator to prevent ice formation. RATs can weigh up to 400 lbs on very large transport aircraft, with blade diameters of between 40 and 60 inches depending on power requirements. 2. Inverters are used to convert what forms of electrical power? (c) resistor value and spring tension. (c) large number of copper wire turns connected in series with the generator output. (c) connect batteries in series. (c) reduces compression on the pile thereby decreasing its resistance.